Become a Digital Master-No Matter What Business You're In If you think the phrase "going digital" is only relevant for industries like tech, media, and entertainment-think again. In fact, mobile, analytics, social media, sensors, and cloud computing have already fundamentally changed the entire business landscape as we know it-including your industry. The problem is that most accounts of digital in business focus on Silicon Valley stars and tech start-ups. But what about the other 90-plus percent of the economy? 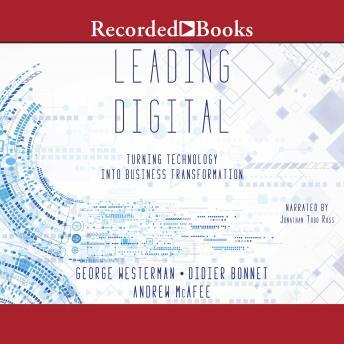 In Leading Digital, authors George Westerman, Didier Bonnet, and Andrew McAfee highlight how large companies in traditional industries-from finance to manufacturing to pharmaceuticals-are using digital to gain strategic advantage. They illuminate the principles and practices that lead to successful digital transformation. Based on a study of more than four hundred global firms, including Asian Paints, Burberry, Caesars Entertainment, Codelco, Lloyds Banking Group, Nike, and Pernod Ricard, the book shows what it takes to become a Digital Master. It explains successful transformation in a clear, two-part framework: where to invest in digital capabilities, and how to lead the transformation. Within these parts, you'll learn: - How to engage better with your customers - How to digitally enhance operations - How to create a digital vision - How to govern your digital activities The book also includes an extensive step-by-step transformation playbook for leaders to follow. Leading Digital is the must-have guide to help your organization survive and thrive in the new, digitally powered, global economy.